Tired of throwing money, people and resources at new product delays and still not getting the results you need? Are you a business leader with talented people and solid technology, yet too many of your new products are delayed – finishing late and taking longer than they should? Key projects finish late and take what seems like forever with costly overruns. You don’t find out about problems until it’s too late to do anything about it. No one seems to have time to work on the important projects – the products customers will buy. Money is wasted on projects that just end up being canceled before launch. Products that are launched don’t have the sales impact needed; new product volumes rarely hit their targets. Then there’s the downstream impact these issues cause. Most companies spend less than 5% of sales on new product development, but new product failures create costs well beyond product development in terms of raw materials, components, work in process, and finished goods inventories. Canceled or delayed new products distract the organization and are a disruption that propagates throughout the organization all the way to the customer. If you’re not seeing the growth desired from your innovation, you’re not alone. According to one study, half the leaders surveyed were dissatisfied with their return on innovation spending; unfortunately, the results are even worse for industrial companies. Companies struggle with this because they overlook the need and lack the skills to use a continuous improvement approach for improving their own innovation capabilities. Most companies would never dream of allowing less than 100% quality raw materials into their manufacturing process. But many of those same companies allow their product development process to work on ideas that wouldn’t stand up to that kind of rigorous inspection. Like manufacturing, innovation is a process with inputs, steps, and outputs. When companies begin to apply the appropriate continuous improvement concepts to innovation the results can be dramatic – and it doesn’t stop there. Over time, companies elevate their capabilities and create a culture of innovation improvement that pays growth dividends for years to come. What if you could see new products become a more impactful and growing contribution to your bottom line? And what if you could achieve that with the staff and resources you already have? Not only would you experience higher profitability and faster growth, but you’d also find it easier to distance yourself from the competition and win the best customers. You might also find more engaged employees looking for ways to contribute even more. 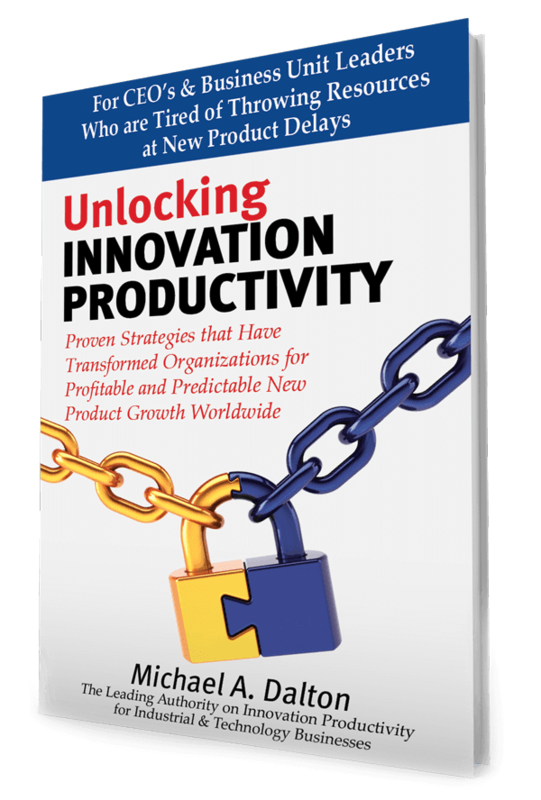 Guided Innovation uses a proven, five-step continuous improvement approach to eliminate your innovation bottlenecks. Our new product innovation consulting starts with diagnostics to identifying the constraints holding back your growth and their root causes. Then in a series of hands-on workshops, we help you and your team work through the issues one at a time for maximum effectiveness. 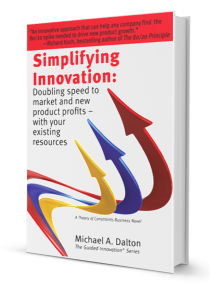 You’ll see new products generate more impact in less time, ultimately developing a culture of continuous innovation improvement – meaning growth dividends for years to come. Project workload reduced from 50 down to 5 projects while new product output increased and generated impactful revenue in months not years. Can we help your company get more impact from your innovation investment? We hope that you’ve enjoyed this overview and that you will browse the rest of the site. You might want to start by clicking here to learn more about the kind of clients we serve. Or read about the results our clients have achieved using our unique approach to continuous innovation improvement. You can also visit our blog or free resources page for some valuable reports offering tools and tips for improvement. Enjoy browsing the site and thanks for visiting.